Computer and tailoring classes in progress for the tribals as part of the women empowerment program in Attappady, Kerala. 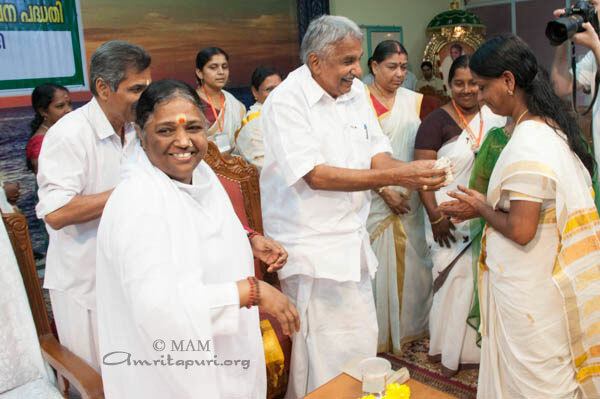 Kerala Chief Minister Oommen Chandy inaugurated Haritamritam, a new humanitarian initiative of the Mata Amritanandamayi Math today in Amritapuri Ashram in the presence of Amma. Haritamritam is an initiative to promote organic farming in the state. Through Haritamritam, MAM is promoting vegetable cultivation. This will be initiated via Amrita SREE self-help-groups members. More than 10,000 Amrita SREE members from Kollam and Alappuzha will be growing vegetables on their own land. A total of 1,000 acres of land—comprising individual plots ranging from one cent to one acre—have been earmarked for Harithamritam’s first phase. Amma’s words were full of optimism and hope. “Even if a person is able to do organic farming in one cent of land, it is a big step in restoring the lost harmony of nature. We have not inherited the land from our ancestors; we have borrowed it from our children. We have to return this land to the coming generations without allowing even the slightest damage to happen to it” said Amma in her benedictory address. 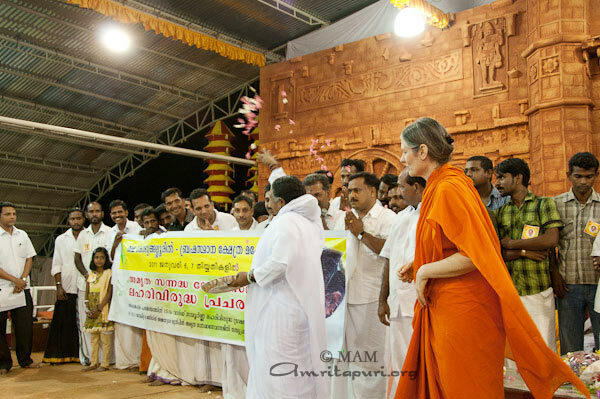 “May this ‘Haritamritam’ scheme bring about an awakening and enthusiasm in all to strive for good health and to restore the harmony in nature” Amma said. MAM is distributing free seeds to all the participants, and is arranging training and demonstration classes by traditional farmers and agriculturalists adept in organic farming. An instruction booklet prepared by retired agricultural officer TS Viswan—who has dedicated his retired years to promoting organic farming—is also being distributed. Since 2005, the Mata Amritanandamayi Math (MAM) has put more than 100,000 women into more than 6,000 AmritaSREE self-help groups. 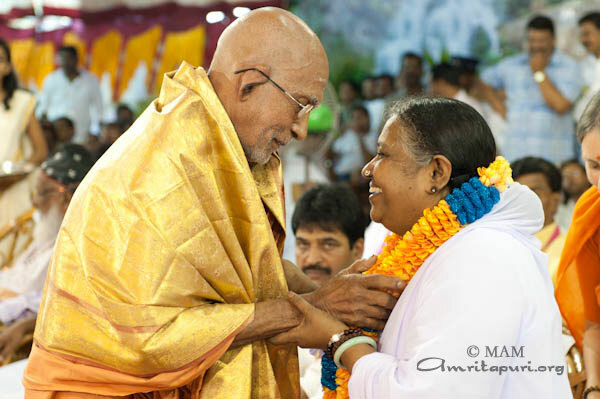 Each year on Amma’s birthday, Mata Amritanandamayi Math inaugurates new charities, expands existing ones and releases a number of new publications. There was a formal public function for this as part of the birthday celebrations. Many dignitaries were there for the function. They include: His Excellency Sri. K. Sankaranarayanan, the Governor of Maharashtra; Sri. Vilasrao Deshmukh, Honourable Union Minister for Science & Technology and Earth Sciences; Sri. K.C. Venugopal, Honourable Union Minister of State for Power; Sri. Vishnupada Rai, MP, Andaman Islands; Sri. N. Peethambara Kurup, MP, Kollam; Philipose Mar Chrysostam, the senior Metropolitan Bishop of the Mar Thoma Church; Swami Prakashananda, Head of Sivagiri Ashram; Swami Pranavananda Teerthapada, Head of Panmana Ashram; Sheikh Aly N’Daw, the President of the International Sufi School in Senegal; Sri. M.P. Veerendrakumar, Managing Director of Mathrubhumi; and Sri. O. Rajagopal, former minister, amongst others. Swami Amritaswarupananda formally welcomed all of them. “For most people, birthdays are a holiday—a day we stop everything and allow the world to worship us. We become ‘king for a day.’ Our spouse and children do special things for us. We get presents. A feast is prepared. Perhaps we don’t even go to work. We stay home and relax. Very often, if someone asks us to help them on this day, we say, ‘Please, not today. 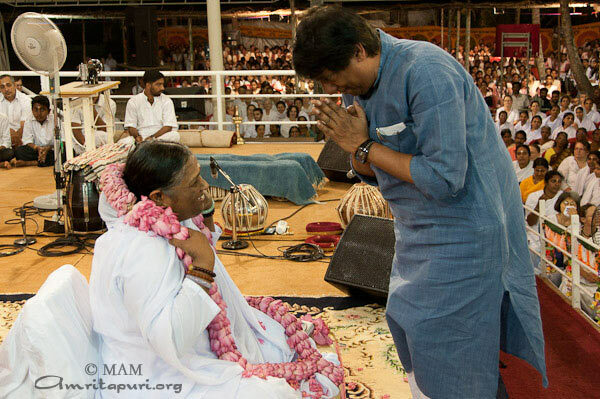 It’s my birthday.’ But for Amma, this is yet another day to selflessly serve the world, just as she does seven every other day.” said in his welcome speech. Two new projects were lauched on this occasion. Free Tuition Program by Sri. Vilasrao Deshmukh, the Honorable Union Minister for Science & Technology and Earth Sciences and Amrita Santvanam by His Excellency K.Sankaranarayanan, the Governor of Maharashtra. Amrita Nidhi pension program – providing widows and other disadvantaged individuals with monthly pension checks was extended to another 5,000 beneficiaries throughout India. The checks were officially presented to 25 beneficiaries by Sri. N. Peethambara Kurup, MP. As part of AmritaSREE Suraksha – a joint venture between the Mata Amritanandamayi Math and the Life Insurance Corporation of India – 3,000 scholarships to children of members of AmritaSREE (Self Reliance Economic Empowerment) self-help groups were distributed by Sri. K.C. Venugopal, Honorable Union Minister of State for Power. The Vidyamritam Scholarship Program, was also extended. Sri. Vilasrao Deshmukh distributed the scholarships to 25 students, representing the 5,000 new beneficiaries. MAM Mission Trusts following books was released by Sheyl Al N’Daw, the President of the International School of Sufis, Senegal. Amrita Books was launched on Amma’s 57th birthday in order to ensure books of about Amma and her teachings are available in books stores in India. Its four books were released on this occasion. 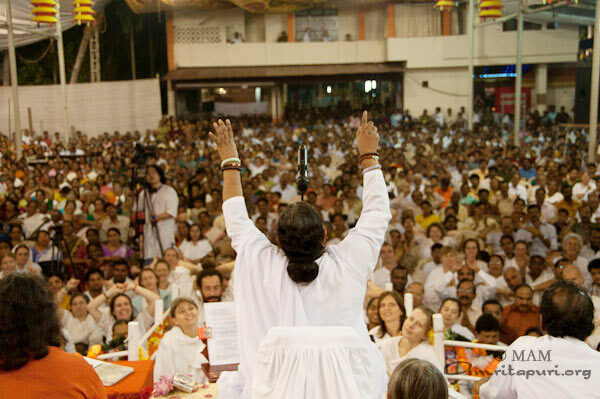 Amma: The Life of Sri Mata Amritanandamayi Devi – in Hindi, Kannada and Telugu. Matruvani Birthday Souvenir by Swami Prakashananda, the head of Sivagiri Ashram. Amma’s Advice: Ancient Wisdom for Modern Times, a coffee-table book by Konarak publications by His Grace Dr. Philipose Mar Chrysostam Mar Thoma Metropolitan. 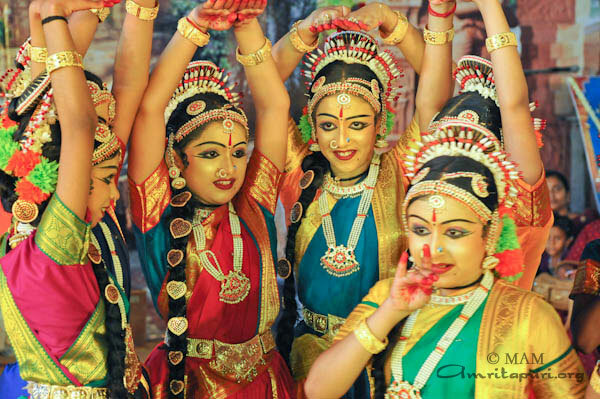 This year’s Amrita Keerti Puraskar went to Sri. Veerendrakumar, the managing director of Mathrubhumi, in recognition of his philosophical travel memoir, Haimavatabhuvil. Veerendrakumar was presented with the customary cash award of Rs. 1,23,456, a statuette created by sculptor Namboodiri, as well as a citation were presented by His Excellency Sri. K. Sankaranarayanan, the Governor of Maharashtra. 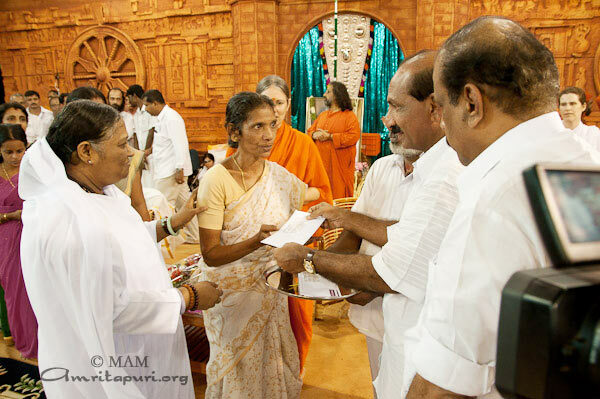 Amma also conducted a mass marriage for the underprivileged couples. 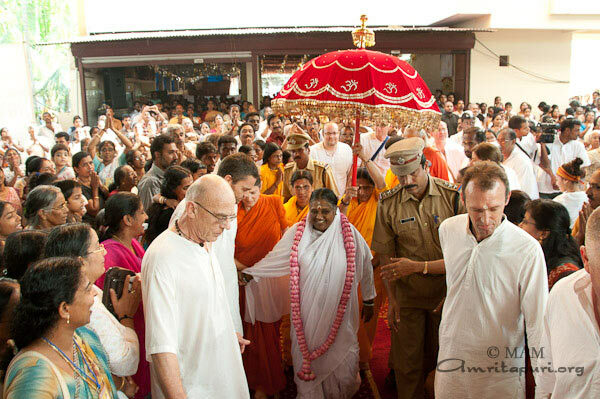 It was Kodungalloor that Amma reached next, after the successful program at Kozhikode. 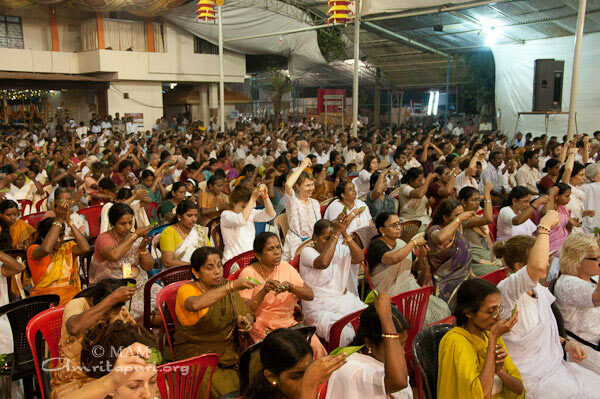 Kodungalloor is the site of the first Brahmasthanams born out of Amma’s sankalpa. 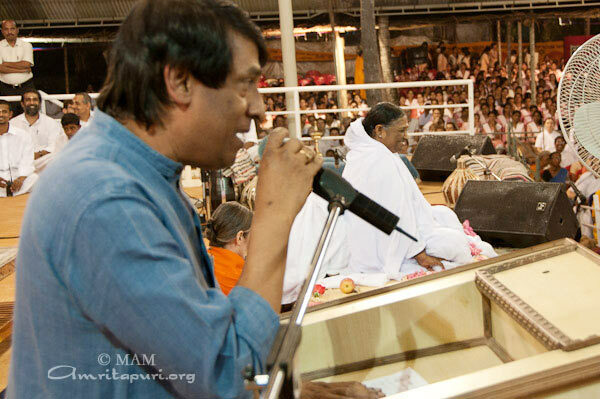 The stage was filled up by many dignitaries, on the first night of the program on 6th. Notable were AICC secretary Tom Vadakkan, Thrissur Mayor IP Paul, KP Dhanapalan MP, and Viswambaran IAS the Vice Chancellor of Agricultural University. Vidyamritam Scholarship and working capital to Self Help groups were distributed. The dignitaries helped hand over these to the beneficiaries. As a step towards fulfilling Amma’s wish, villagers of Kaipamangalam took mass-oath to make theirs an intoxicant-free village. 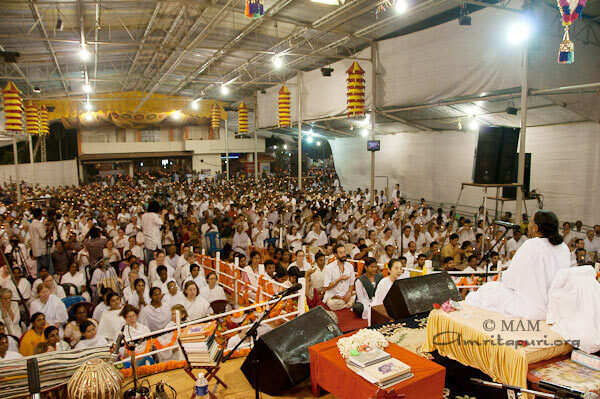 On the first night of Amma’s programs at her ashram in Tiruvanantapuram, the Mata Amritanandamayi Math (MAM) furthered its commitment to education. Vidyamritam Scholarships were given to 180 children of Tiruvanatapuram District, and MAM inaugurated its new arts-and-crafts school, Amrita Shilpa Kalakshetra. In the presence of Amma, G. Sudhakaran, minister of the Devaswam Board of Kerala, inaugurated the arts-and-crafts school. Addressing the gathering, he said, “This world is full with tension and war. 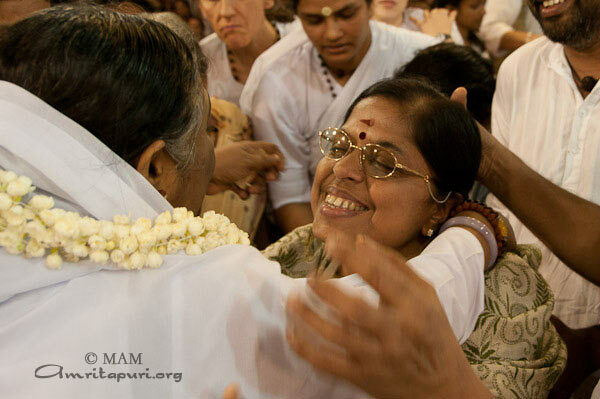 Peace and harmony is the slogan of Amma. War can be for good or bad. Reject the bad. 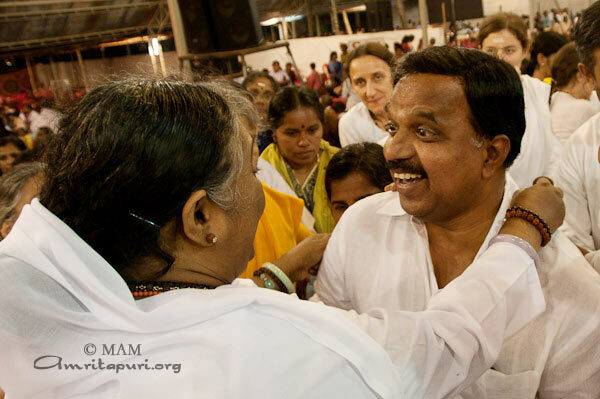 Even if the war is for good, it should reach peace – that is the message Amma presents before us. 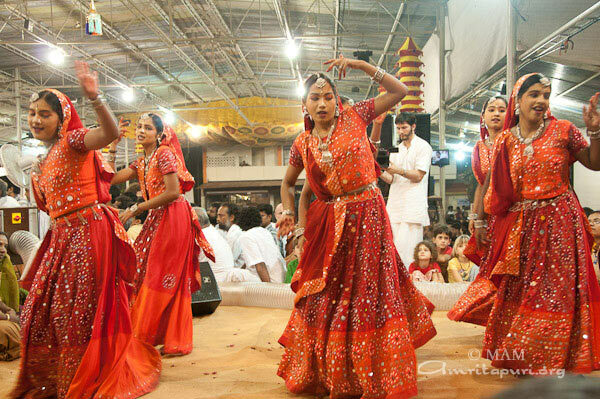 Amrita Shilpa Kalakshetra is an extension of MAM’s university, Amrita Vishwa Vidyapeetham. One of its primary aims is to train talented youth in traditional wood-carving, an important aspect of Indian art. Like most crafts in India, wood carving was traditionally taught by artists to their children, and thus carried down from generation to generation. As such traditional lineages have deteriorated, it is MAM’s intention to help restore the lost art to its former glory and status. The institute’s training program is recognized and approved by the Government of India’s Development Commissioner of Handicrafts, Ministry of Textiles. The institute is located in Poonkulam, Vellayani, Tiruvanantapuram. It will soon begin conducting month-long and six-month-long courses, providing deserving students monthly stipends of Rs. 2,000 during their courses. Other dignitaries present on the dais included P. Surendran Pillai, MLA; George Vargheese, deputy director of Handicrafts Department, Government of India; and arts patron Akira Fujisawa. * Launched in 2007, Amrita Sree will benefit 100,000 women. It is part of MAM’s Farmer Suicide Prevention Program. The goal is to form 5,000 self-help groups. So far 3,000 have been created. Not only does MAM help the women form the groups but also helps them attain bank loans for working capital. Amrita Self Help Groups were inaugurated at Mandapam, Ramanathapuram District, Tamil Nadu at a function held at Raja Mahal. 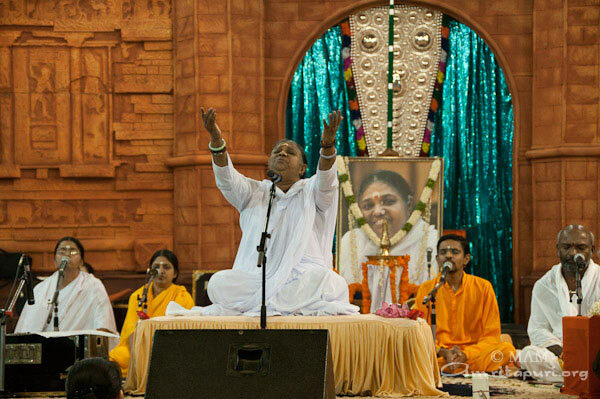 The program was held in conjuncture with celebrations for Amma’s 55th birthday. 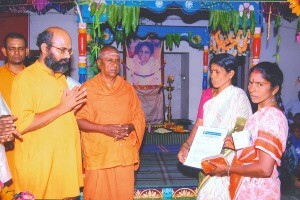 Swami Paramananda of Ramakrishna Tapovanam helped distribute certificates to the members of the newly formed groups. 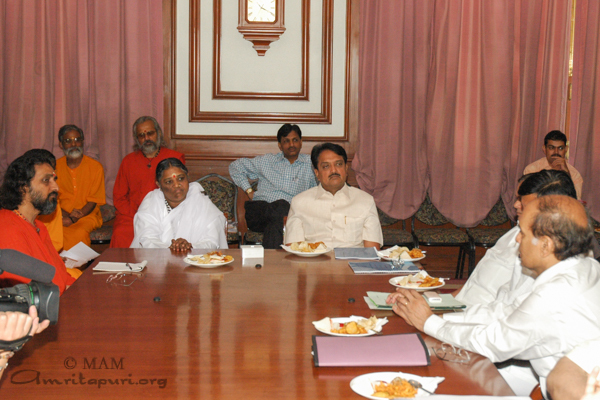 Chief minister of Maharashtra Vilasrao Deshmukh held a high-level meeting with Amma at the Sahyadri government guest house here on Thursday on the issue of suicides by farmers of Vidarbha. 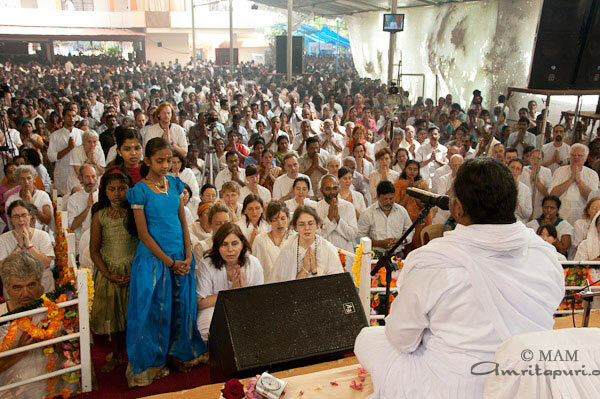 After the meeting Amma announced that the Ashram will undertake an Rs. 200-crore [$45.4 million U.S.] project to tackle the problem of suicides by farmers of Maharashtra, Kerala and other states. 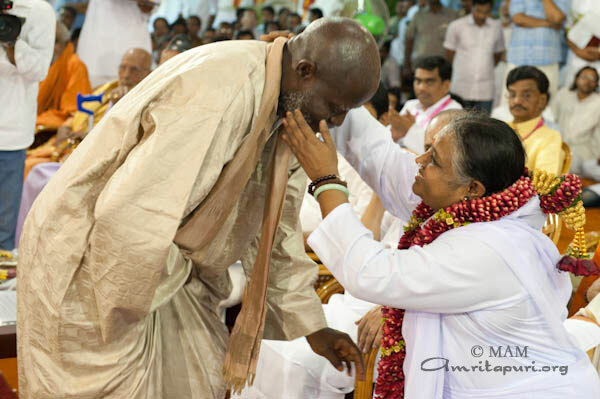 Amma was deeply concerned about the large number of suicides by the cotton growers of Vidarbha. During an hour-long meeting, Chief Minister Deshmukh, chief secretary D.K. Sankaran and other senior officials briefed Amma about the extent of the problem and the steps taken by the government to tackle it. Deshmukh said as a result of a series of steps taken by the state government and the Centre, the problem is now beginning to come under check. “But the problem cannot be solved through economic packages alone. What is needed is social and spiritual interventions so that the farmers realize that suicide is not the way out. In fact, it only further aggravates the problem for the families,’’ Amma commented. The CM agreed and sought Amma’s assistance in dissuading farmers from taking extreme steps. 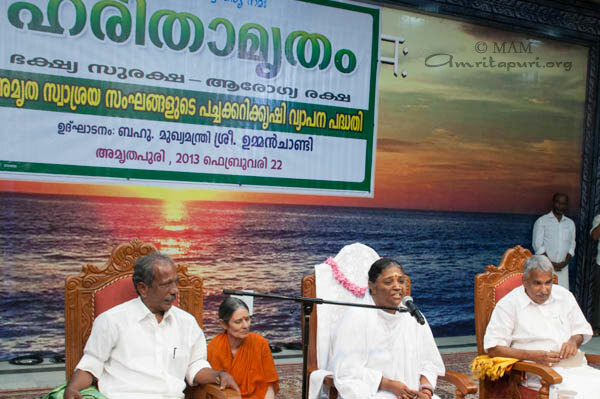 Amma stressed the need for personal counselling of the vulnerable persons. She recalled the experience of MAM volunteers in dealing with a similar problem in thw Wayanad District of Kerala. 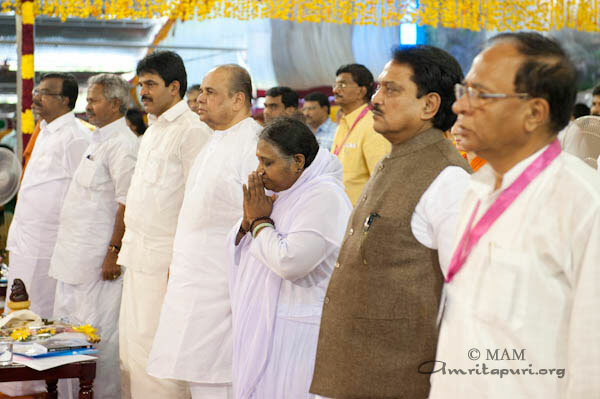 Amma appreciated the efforts made by the Maharashtra Government and said it represented the best efforts taken by any state government to deal with the problem of farmers’ suicides. She said even though in comparison to the total number of suicides taking place in the country the suicides by farmers may be less, in absolute terms the numbers are large enough to warrant expeditious interventions at all levels. The hysteria among farmers needs to be neutralised and associated problems like alchoholism etc. need to be remedied. 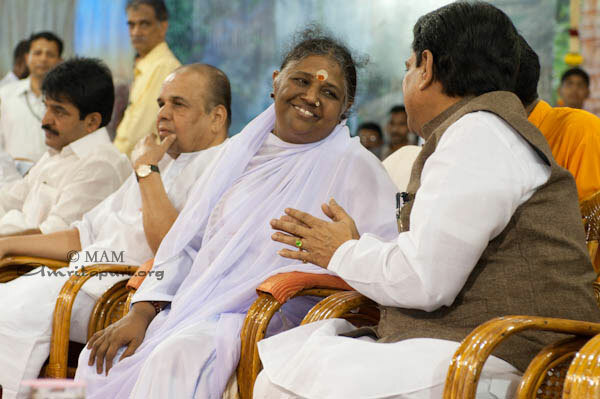 Apart from the chief minister and chief secretary, others who attended the meeting included senior cabinet minister Patangrao Kadam; ministers Balasaheb Thorat and Ramraje Njmbalkar; principal secretaries Sarogi and Pande; divisional commissioner Amravati and Goyal; and some of Amma’s disciples and devotees. 60 Women came to Amritapuri this past Friday to receive their diplomas after completing a 3-month special training course in embroidery, footwear, leather goods, and readymade garments manufacturing. 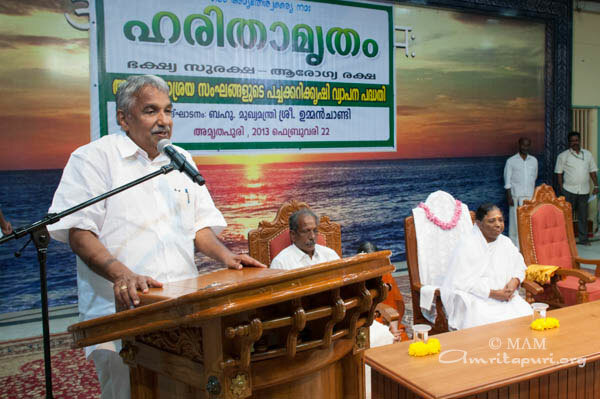 The event marked yet another milestone in the path envisioned by Amma in the wake of the Tsunami – creating self-reliant villages through the Matru Gramam Project. Samples of the women’s efforts surrounded the gathering. 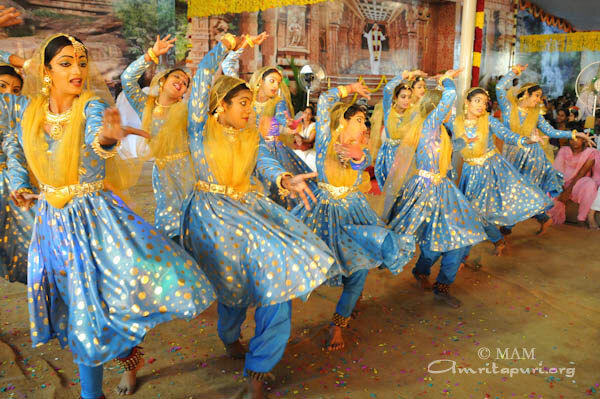 Colorful dresses and intricately embroidered cloths were displayed along with school uniforms, backpacks, pencil kits, purses, shawls, children’s clothing, and men’s and women’s footwear. The high quality items were a testament to the women’s dedication and enthusiasm. 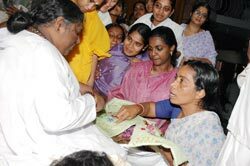 The women were selected to take this course because they had excelled in the basic training classes previously offered by the Ashram. They are being encouraged to use their newly obtained skills to start their own businesses, form co-operatives, or seek outside employment. Watching the women disperse, one could only imagine the new lives and livelihoods that will soon blossom as they head into the next chapter of their lives. 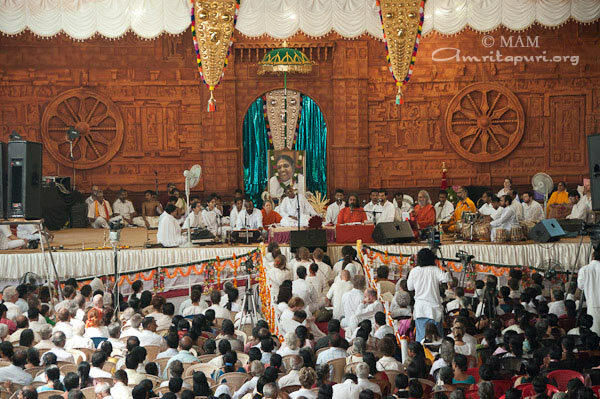 For anyone who has been following the evolution of the Ashram’s tsunami-relief work, it is clear that Amma’s intention is not merely to repair what was broken by the tsunami, but to fix things that had broken way before that fateful day. Through the door opened by the disaster, the Ashram has rushed in with everything from better houses, to better venues of education and employment, to better to medical care. 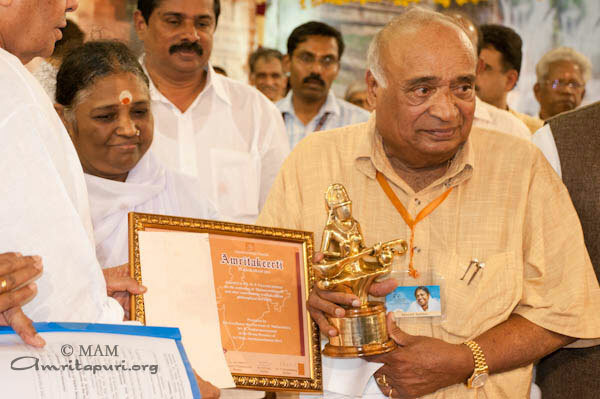 This vision of Amma’s is reaching its full fruition through a programme called Matru Gramam, (News) or Mother’s Village. Matru Gramam involves the implementation of a systematic plan to make small villages in Kerala more self-reliant, primarily through the establishment of self-help groups. 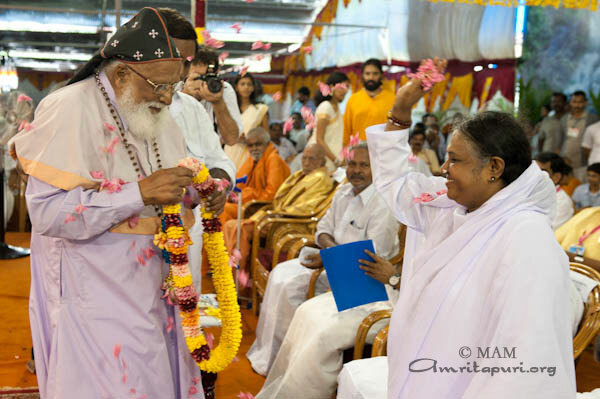 The first Matru Gramam is Alappad Panchayat, the collection of villages located on the peninsula in Kollam District, Kerala, where the Amritapuri Ashram is located. 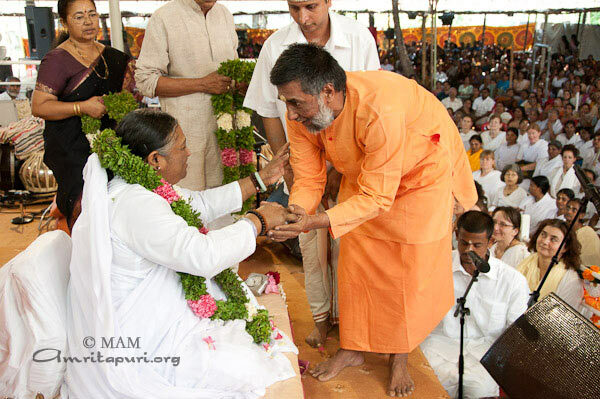 Matru Gramam will not be limited to the immediate area around the Ashram. 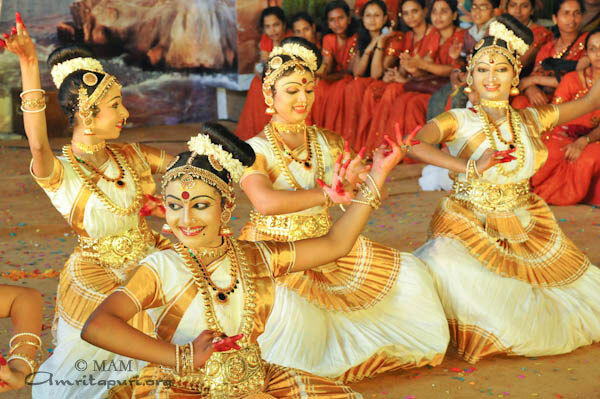 But the programme will soon expand to all of Kerala’s 14 districts. With this in mind, the Matru Gramam villages will produce their own vegetables, clothes, soaps, sandals and other necessities. 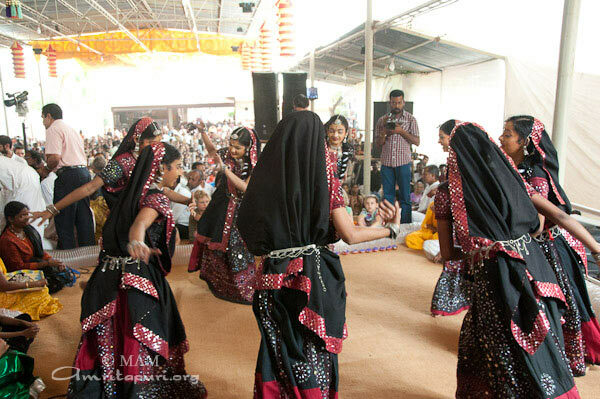 In order for the villages to accomplish this, the Ashram will help them establish self-help groups. Depending on the size of the village, the self-help groups will comprise 10 to 20 members—one person from a family. Four to five of these cooperatives will then join together to form a cluster. 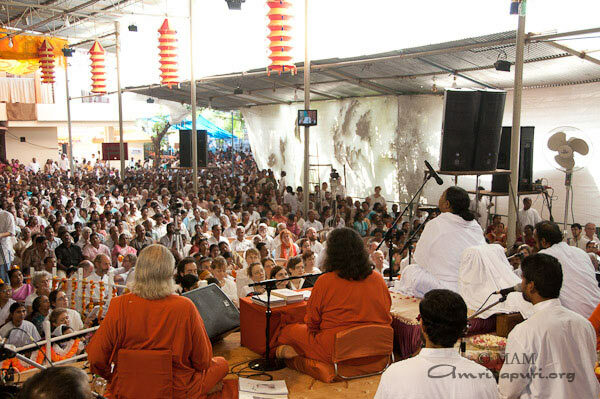 The Ashram is providing the training in the fields the groups decide upon. For example, two of the groups in Alappad Panchayat are a sandal-making group and a tailoring group. The Ashram is also helping the villagers set up group bank accounts, as well as will coordinate and monitor their groups. 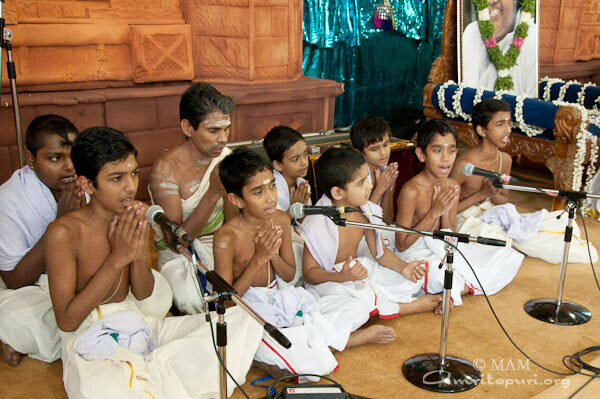 The first Matru Gramam meetings took place in Amritapuri in early September. In Alappad, the majority of the men work as fishermen, so the cooperatives will mainly comprise women. “I’ve come with hopes of earning additional money to support my two children who are attending school,” said Sebini, a young women from Alappad. “My husband is a fisherman, but his daily catch is unpredictable and we cannot survive on it.” Just prior to the meeting, Sebini had successfully completed the free tailoring classes provided by the Ashram. The Ashram is providing her and the other ladies in the self-help group with the sewing machines needed for their work. This will be Sebini’s first job. In fact, the self-help groups have already received work orders, including some for government departments. 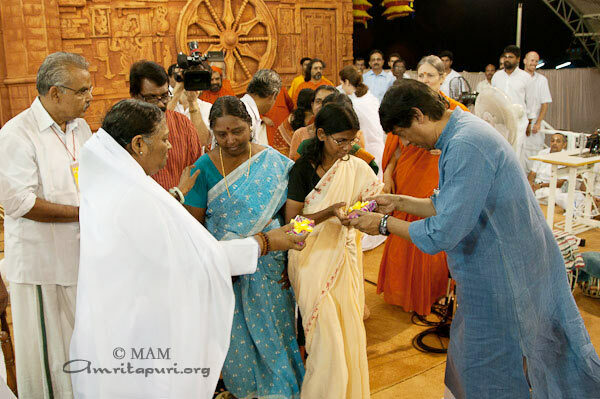 Recently, the women working in the different self-help groups came to Amma with the first fruits of their work. The tailoring group with their towels, the sandal group with their sandals. When the sandal-making group offered their wares to Amma, Amma smiled, encouraged the ladies and then placed a pair of sandals on her shoulders—one on the right, one on the left—to show her pride in their accomplishment.